Human CD28 Antibody Enhances IL-2 Secretion in Jurkat Cells. Human CD28 Monoclonal Antibody enhances IL-2 secretion in the Jurkat human acute T cell leukemia cell line stimulated with 10 ng/mL phorbol myristate acetate (PMA) and 0.5 ╡M calcium ionophore, in a dose-dependent manner, as measured using the Quantikine Human IL-2 ELISA Kit (Catalog # D2050 ). The ED50 for this effect is typically 0.2-0.6 ╡g/mL. 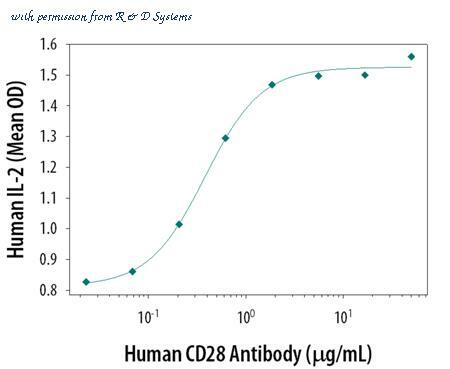 Human CD28 Antibody Enhances IL-2 Secretion in Jurkat Cells. Human CD28 Antigen Affinity-purified Polyclonal Antibody enhances IL-2 secretion in Jurkat human acute T cell leukemia cell line stimulated with 10 ng/mL phorbol myristate acetate (PMA) and 0.5 ╡M calcium ionophore, in a dose-dependent manner, as measured using the Quantikine Human IL-2 ELISA Kit (Catalog # D2050 ). The ED50 for this effect is typically 0.3-0.6 ╡g/mL. Figure A. Alexa Fluor647 conjugated mouse anti human CD4 ( MCA1267A647 ) and RPE conjugated rat IgG2b isotype control ( MCA6006PE ). Figure B. Alexa Fluor647 conjugated mouse anti human CD4 ( MCA1267A647 ) and RPE conjugated rat anti human CD28 ( MCA709PE ). 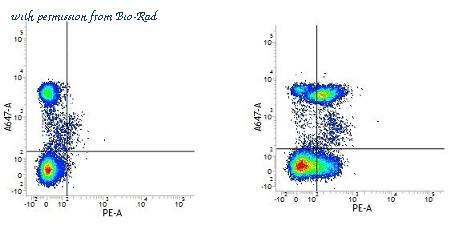 All experiments performed on human Peripheral blood lymphocytes in the presence of Human SeroBlock ( BUF070A ). 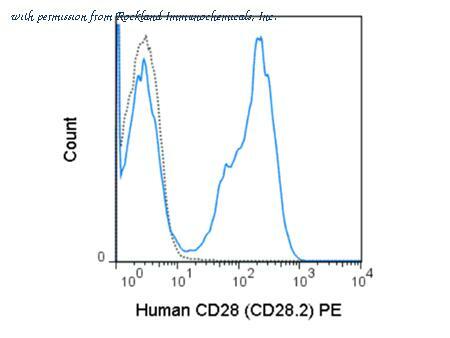 Flow Cytometry of Mouse anti-CD28 Fluorescein Conjugated Monoclonal Antibody. Cells: human peripheral blood lymphocytes. Stimulation: none. 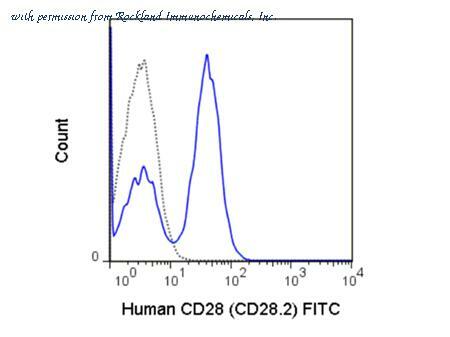 Antibody: (Dotted Line) FITC Mouse IgG1 kappa isotype control; (BLUE) Fluorescein Anti-CD28 mouse antibody using 5 ul. Flow Cytometry of Mouse anti-CD28 Phycoerythrin Conjugated Monoclonal Antibody. Cells: human peripheral blood lymphocytes. Stimulation: none. Antibody: (Dotted Line) PE Mouse IgG1 kappa isotype control; (BLUE) Phycoerythrin Anti-CD28 mouse antibody using 5 ul. 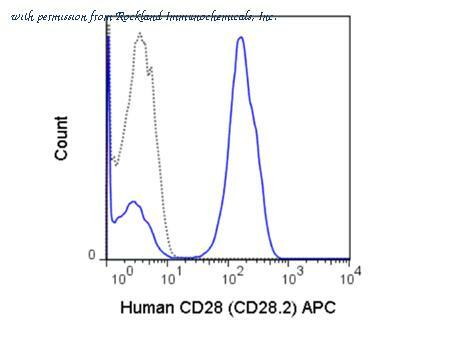 Flow Cytometry of Mouse anti-CD28 Allophycocyanin Conjugated Monoclonal Antibody. Cells: human peripheral blood lymphocytes. Stimulation: none. Antibody: (Dotted Line) APC Mouse IgG1 isotype control (0.25µg); (BLUE) Allophycocyanin Anti-CD28 mouse antibody using 5 µL (0.25µg). 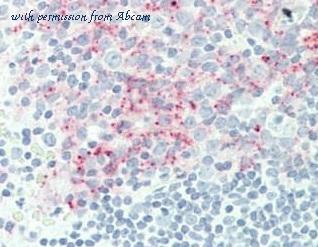 Immunohistochemical staining of human lung carcinoma tissue using CD28 antibody. Immunohistochemical staining of human colon cancer tissue using CD28 antibody.